Breanna Ries joined the Medical of Wisconsin in the Department of Obstetrics and Gynecology in April 2011. 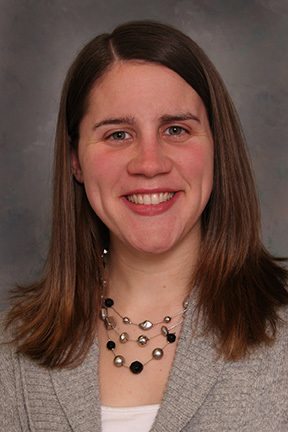 Born and raised in Sheboygan, WI, she received her Bachelors degree in Biology from St. Norbert College in 2007 and her Masters degree in Physician Assistant studies from Rosalind Franklin University of Medicine and Science in 2009. She became board certified in 2009 and is licensed in the state of Wisconsin. Prior to joining the Medical College of Wisconsin she practiced at a private Obstetrics and Gynecology clinic near Gurnee, IL for nearly two years. Breanna’s practice involves caring for women from adolescence onward. She performs routine obstetrical care and sees individuals throughout their pregnancy and after delivery. She also provides routine gynecologic care including gynecologic examinations, contraceptive counseling, management of abnormal bleeding, and a variety of other gynecologic concerns. Breanna is a member of the American Academy of Physician Assistants (AAPA) as well as the Association for Physician Assistants in Obstetrics and Gynecology (APAOG). Breanna sees patients in the Obstetrics and Gynecology clinic at Froedtert Hospital, located in our Specialty Clinics Building, formerly known as Froedtert East Clinics. Outside of the workplace Breanna enjoys spending time with her husband, family, and friends. She enjoys running, reading, cooking, and cheering on the Milwaukee Brewers. Breanna Ries, in my option, is one of the best providers I’ve had in all of my adult life. She helps to understand and takes time to listen and gives her all in what she does. Simply wonderful. Thank you. Breanna Ries is always wonderful! She takes her time to listen to my concerns and explains everything in detail.